A scorecard by immigration advocates on House members votes on immigration-related measures split the Arizona delegation on party lines, with all four Republicans getting a zero and Democrats getting no less than an 73. WASHINGTON – All four Republican representatives from Arizona got a zero on a new national scorecard that rated all House members for their votes on nine immigration-related measures and statements on the issue. 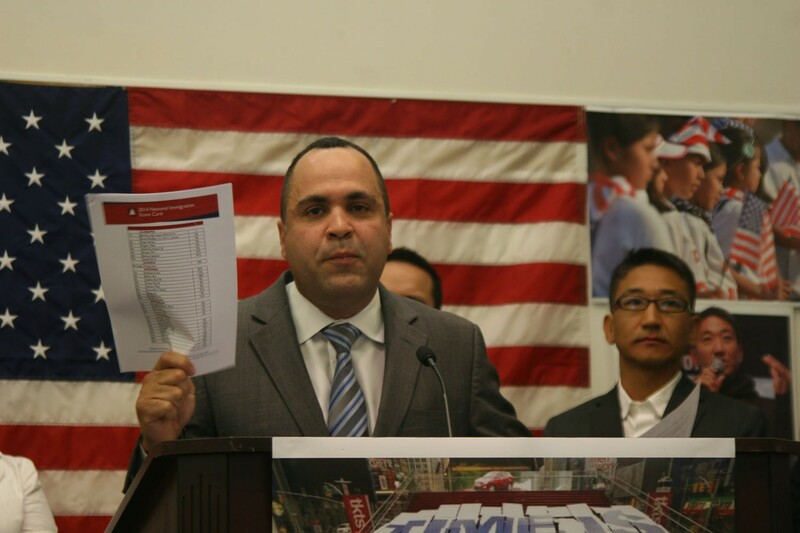 Arizona’s Democrats fared better on the 2014 National Immigration Score Card, released Monday by a coalition of 10 immigration advocacy groups, getting scores ranging from 73 to 100 percent. 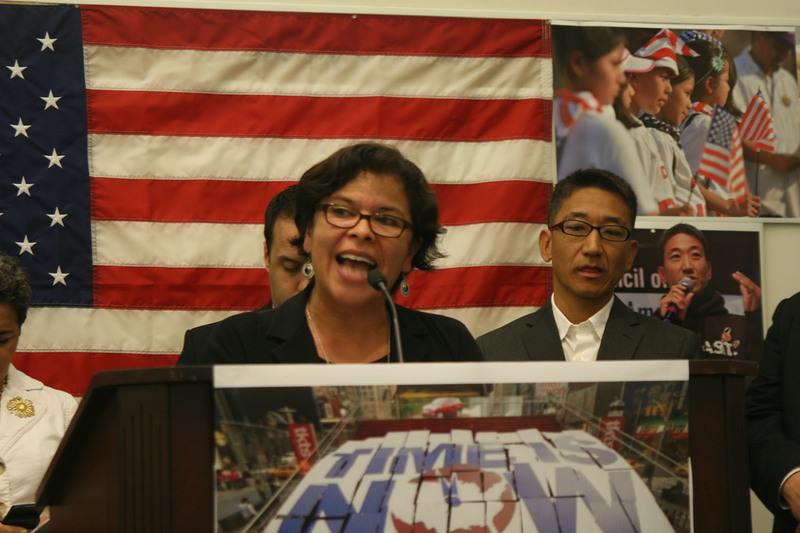 The scorecard is meant to “make sure that our communities truly understand who and how our leaders in Congress fail on the one issue that is so important to all of us,” said Rocio Saenz, a board member of Mi Familia Vota, at a news conference to release the report. The ratings are based on representatives’ positions on nine immigration-related bills or amendments, on everything from border security to proposals aimed at keeping immigrant families intact. It also weighed statements that members were asked to make in favor of immigration reform with a path to citizenship and in support of family reunification. Given the groups who were behind the scorecard, Rep. Paul Gosar, R-Prescott, welcomed his zero score in an email Monday. In his statement, Gosar noted the affiliation of the groups that released the scores. 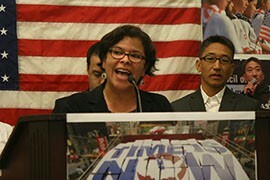 Sponsors of the scorecard included the League of United Latin American Citizens, Mi Familia Vota, the National Council of La Raza, the Japanese American Citizen League, the Asian Pacific American Labor Alliance and others. “The groups sponsoring this score are far-left, race-based groups that undermine our national sovereignty and harm citizens, children and taxpayers,” his statement said. The state’s other three Republican lawmakers – Reps. David Schweikert of Fountain Hills, Matt Salmon of Mesa and Trent Franks of Glendale – did not immediately respond to requests for comment. But Rep. Raul Grijalva, D-Tucson, said he was “honored” by his 100 percent score. “I urge my colleagues from both sides of the aisle to recognize the benefits – both economic and humanitarian – in reforming our system,” he said in a statement. “It’s time to get this done for the American people and for all those around the world who aspire to be our fellow citizens,” his statement said. Rep. Ron Barber, D-Tucson, had the lowest score of Arizona’s Democrats, at 73 percent. He fell short for not supporting a perceived pro-immigrant position on three of the scorecard’s key votes. But the advocates behind the scorecard said it is time for voters to act. 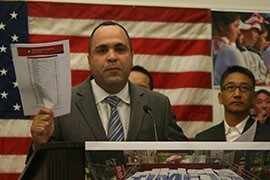 Jose Calderon, the president of the Hispanic Federation, holds up a copy of the 2014 National Immigration Score Card that was produced by his and other immigrant advocacy organizations.